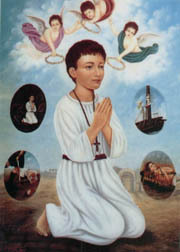 Abanoub's relics, as well as the relics of many Christians who died with him, are still preserved in St. Virgin Mary and St. Abanoub church in Samanoud. It is also said that the Holy Family visited that place during their Flight Into Egypt. The church still contains the well from which Our Lord Jesus Christ, St. Mary, and St. Joseph drank. Numerous apparitions and miracles do occur in that church until this very day. 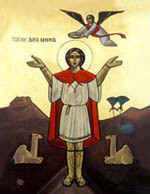 On the Fifteenth day of Hatour, Saint Mina was martyred. His father, Eudoxious, was a native of the city of Nakiyos and was its governor. Eudoxius' brother was envious of him and he brought charges against him before the Emperor, and the Emperor transferred him and appointed him governor over Africa. The people were pleased with him because he was merciful and God-fearing. His mother Euphemia had no children. One day, she went to church on the festival of our Lady, the Virgin Saint Mary at Attribes, where she saw the children in the church wearing their beautiful clothes with their parents. She heaved a sigh and wept before the icon of Our Lady Saint Mary, entreating her to intercede for her before the Lord, in order that He would give them a son. A voice came from the icon saying, "Amen." Euphemia rejoiced in what she had heard and realised that the Lord had heard her prayers. When she returned to her home and told her husband about it, he replied, "May God's Will be done."